The voice on the phone was mysteriously inviting: fly to our secret launch site and we'll show you our newest boat, the Sea Ray Sundancer 540. Come alone. No tape recorders. No cameras. 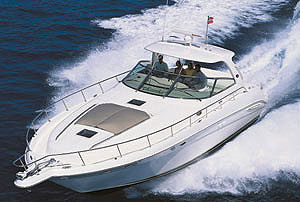 The 2000 Sea Ray Sundancer 540 was the latest and greatest when it was introduced. It wasn't long before I was driving east across the bleak flatness of mid-Florida toward the aptly named Space Coast, where America launched its exploration of space. The names are evocative: Astronaut High School, Satellite Beach and, of course, Cape Canaveral. Silhouetted against the skyline off to the north, I could see the rocket towers of Canaveral, but mine was a different mission and I had no time for space shuttles or Mars probes. Under a threatening black sky, I turned off on a side road and followed a nondescript sign to a heavily fenced compound. The uniformed guard eyed me warily, murmuring into a walkie-talkie after I gave him my name. Looking around nervously, I could see that the buildings were carefully nondescript, except for one that had a sign saying simply, Product Development and Engineering. The radio chattered briefly and I thought the guard was going for his weapon, but he was only pointing to where I should park and wait to be met. When my contact arrived, he shook hands briefly and gave his name in military shorthand: "Hungerford, Mike." He looked like he wanted to frisk me, or at least take a look inside my briefcase for spy cameras. The moment passed. "Ready to see our newest?" he asked rhetorically, knowing that I'd flown 3,000 miles and endured endless screaming children to get there. "You're the first to see her," he said. "We aren't letting any other press in for another month or so." Why me, I thought, but didn't ask. Hungerford set off at a parade-ground pace, and I trotted after him. Rounding a corner of the PD&E building, he stopped suddenly. "There," he said. I looked where he pointed, and knew that this was worth the hours in the airports, the long drive, and even the airline food. What lay before me wasn't some sort of James Bondian space laser. It didn't have the markings of anything remotely military, nor was it intended for outer space. Yet I knew that it was definitely going to cause a stir throughout America when it was finally unveiled to the public. And, just as the thunder of U.S. rockets lifting off Canaveral launch pads caused tremors worldwide during the Cold War, I knew that this high-tech creation was going to cause a similar ripple throughout the marine industry. 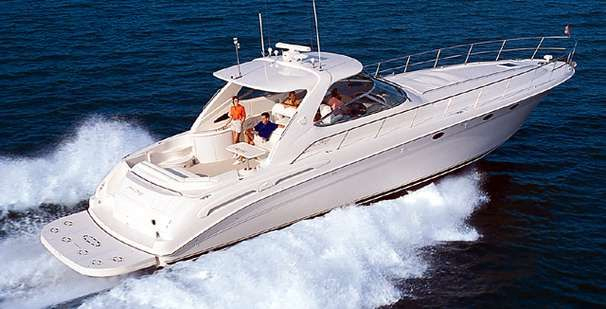 It was, of course, the brand-new Sea Ray 540 Sundancer. I was being given a sneak preview of the prototype of a big offshore express cruiser with a heart of pure luxury, the body of a European starlet, and the power of a Titan booster rocket. More than any builder, Sea Ray has had a unique relationship with express cruiser styling over the years. The early Sundancers (Sea Ray's proprietary name for its express cruisers) not only helped establish the Sea Ray name worldwide, but they almost single-handedly repopularized the express cruiser, which had fallen out of favor as fiberglass cabin cruisers came along in the 1950s. By definition, an express cruiser is one that combines the speed and ample cockpit size of a runabout with the cabin accommodations of a cruiser. Most express cruisers fall in the 25- to 35-foot range, but the 540 Sundancer shows off the benefits of a yacht version. And, if an express cruiser is good at 30 feet, then the 540 is really good. This isn't the first of Sea Ray's big express cruisers, with the 500 introduced about seven years ago, the 580 last year, and others like the 630 topping the line. "What we wanted," says Arnie Dingman, the project manager for the 540, "was a boat that was wider than our 500 to gain extra interior room and longer for more cockpit space. But, even though it was bigger, wider and therefore heavier, we wanted the overall performance to equal the smaller boat." 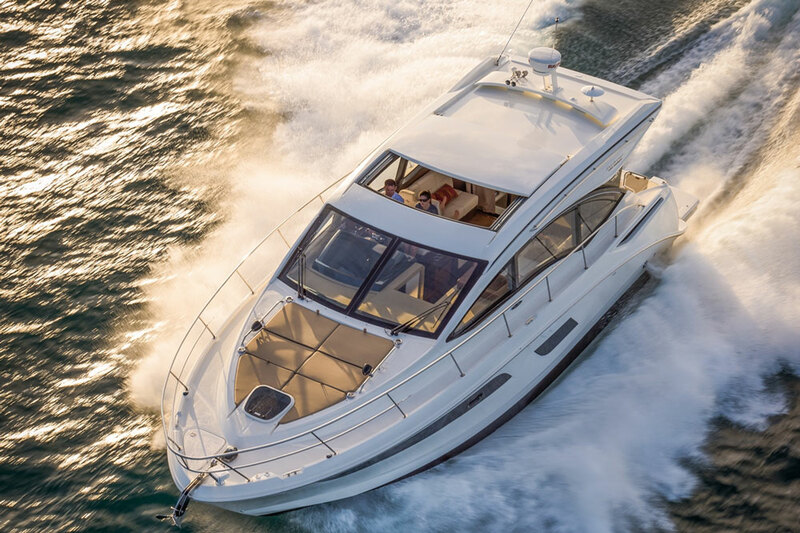 Sea Ray achieved that goal on our test boat with a pair of Caterpillar 3176 diesels that move twenty tons of yacht, filled with cherry paneling, leather upholstery and another ton of fuel, through the water at nearly 37 mph. 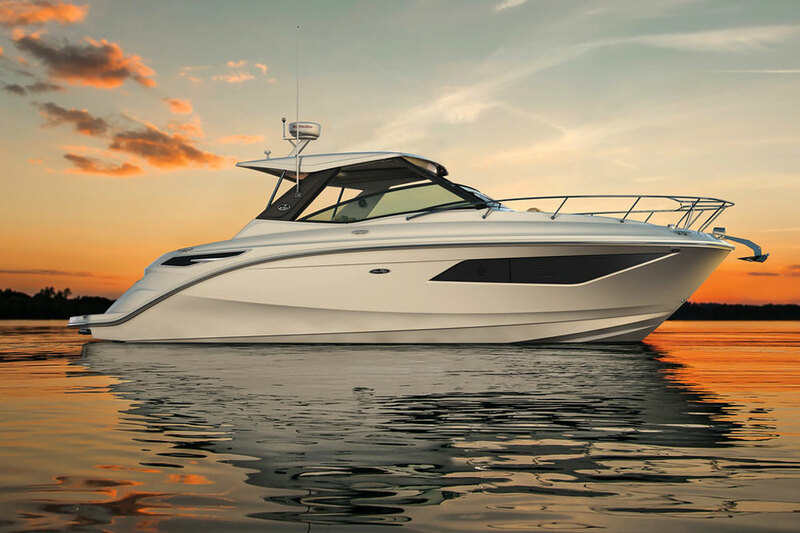 Let's take a look aboard, and see what Sea Ray's design team has accomplished. First of all, the cockpit is not only bigger (about 3 feet longer and 1 foot wider), but more usable than the 500. The wrap-around seating in the aft area is divided into two L-shaped lounges, so guests can move around without having to climb over other knees. A complete wet bar is standard on the port side, with refrigerator, ice maker and stowage for bottles and glasses. Many builders have cockpit lounges that convert to sun pads, but Sea Ray did away with all the struggle of filler panels, support legs and extra cushions with a single button. Touch it, and the entire aft bench seat folds neatly out into a big sunpad, and just as quickly returns to a seating role. The helm area is raised above the cockpit level, with a comfortable swivel seat for the skipper and a double-wide companion seat nearby. Sea Ray gets points for the warm beige color of the dash that not only eliminates reflections in the swept-back windshield, but is easy on the eyes on bright days. The Caterpillar multi-function engine monitors filled the burled wood dash, and the wood-rimmed Dino steering wheel tilts so you can stand or sit comfortably. A big panel for flush mounted electronics is angled toward the skipper from the left of the wheel, and a smaller panel is to the right. On the 540, you'll run out of electronics before you run out of space to neatly install them. On the side of the cockpit, a row of rocker switches control all the electrical systems, breakers are hidden in a fold-out panel below, and the Twin Disk Power Commander levers handle both throttle and shift functions electronically for no-muscle maneuvering. Step back to the transom and our test boat had the ultra-wide T&T optional swim platform that can be submerged hydraulically, allowing you to simply float your personal watercraft on or off the stowage chocks without effort. Opposite the helm, you step through a sliding door that disappears into a pocket, providing easy access to the cool and stylish cabin. At first glance, it's obvious that the salon makes full use of the added beam of the 540, with a voluptuous ultra leather sofa curving sensuously along the starboard side. Indirect lighting is hidden behind valances and at floor level under the furniture, providing a soft and intimate look. Our test boat had the optional cherrywood interior, which uses a secret process to achieve what appears to be hundreds of coats of glossy lacquer. 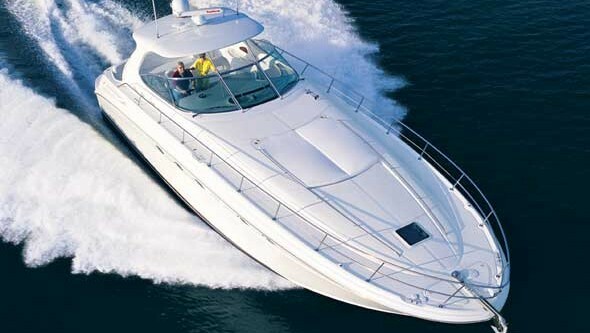 Compare the finish to the finest custom work from the big European yacht builders, and Sea Ray is easily equal. Also available as an interior choice is bird's eye maple, which gives a lighter look than the reddish cherry. 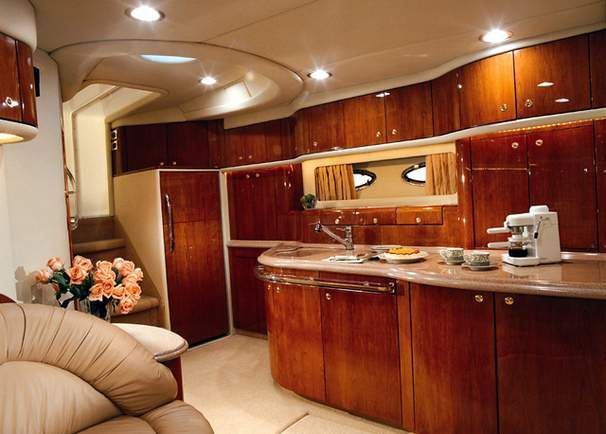 A cherry interior was standard on the 540 Sundancer. To port is a long faux granite counter that looks like a buffet or hors d'oeuvres area until you spot the Grohe Euro-style faucet. Under a removable Corian panel is a big sink, and another panel lifts to reveal a Kenyon three-burner electric cooktop. Tucked behind cherry cabinet doors are a coffeemaker and microwave, and a house-sized stand-up refrigerator/freezer. Closed up, the galley is virtually invisible but, when you need it, it is capable of gourmet fare, including more than ample stowage areas for food and utensils. A lozenge shaped high-low table serves either for dining or as a cocktail table, and a big television with VCR is hidden opposite the sofa for comfortable viewing. Sound hasn't been overlooked on the 540, with a powerful Bose Lifestyle stereo system with six-CD changer, bass module and cube speakers that can easily entertain an entire marina. The center section of the sofa unfolds electrically like the cockpit lounge, providing a spare berth at the touch of a button. Forward, the VIP stateroom has a full-sized island berth, a TV/VCR entertainment center, and roller drawers under the berth. The guest head compartment is all molded for easy maintenance, with an oversized stall shower separated by a curved Lucite door. To allow private access from the forward stateroom, a curtain closes off the salon area from the head and stateroom. Sea Ray's lead designer, Mark Hotary, placed the owner's stateroom amidships for several reasons. "First, it allows the best use of space, since the usual owner's stateroom forward is restricted by the shape of the bow. Second, amidships is the quietest spot on the boat, where the owner won't be disturbed by the sound of water slapping when at anchor." All are valid points, and another example of the thought that went into the design of the 540 Sundancer. The owner's queen-sized berth has a huge stowage area underneath, with gas-lifts to raise the inner spring mattress for access. A vanity area at the foot of the bed has beveled mirrors, and there are twin cedar-lined hanging lockers, a bureau with roller drawers, and a hidden TV/VCR entertainment center with stereo and clock radio. The private head has a spacious shower stall with a seat, tiled floor, and VacuFlush head. The hull is the result of years of Sea Ray design research, and Hotary said they had a straightforward mission: "We wanted a soft riding boat with superior performance. To achieve that, we ran the strakes well forward so they provide lift and soften the hull entry through waves. With the wider chines, the boat has a good planing surface and is stable at low speeds or at rest, too." The 540 has "pockets" molded into the hull for the propellers and shafts, which provide two distinct advantages according to Dingman. "First, it allows a flatter shaft angle so the engines sit level and the props are more efficient. Second, it reduces the depth of the 540 so you can use her in shallow water without fear of hitting the props." Sea Ray is secretive about its design process, but it involves a complete CAD-CAM system from concept to construction, using computer-programmed routers to achieve an accuracy of 1/25,000th of an inch when creating the initial molds and for cutting the bulkheads and other wood parts. I could tell you that a source tipped me off that Sea Ray uses sophisticated Alias software for their design work, as well as EMS computers that provide a double-check of the hull construction as well as mechanical and electrical layouts. With this level of computer access, Sea Ray has essentially the same software that the U.S. Navy uses for designing nuclear submarines. Of course, if I did tell you all this, I'd have to kill you. The hull and deck of the 540 are fully cored with end-grain balsa, which not only adds strength to the hull but provides a layer of sound and temperature insulation. With three separate Cruisaire air conditioning systems and SMX-II climate controls in the salon and staterooms, the 540 is ready for the hottest weather. 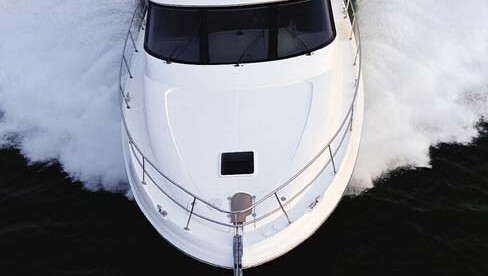 Look closer at the construction details, and you'll see where Sea Ray quality stands out. Each door frame, for example, is individually laminated from layers of veneer, so the rounded corners are flawlessly curved. At the other end of the scale, the big diesels sit on oversized engine mounts of formed aluminum for maximum strength. The engine room is completely insulated with 2-inch sound barrier, and the hatches have fat rubber seals to keep any noise from seeping out. The bilges, even where you can barely see them, are completely get coated for a finished and easily maintained appearance. When the hull is joined to the deck, Sea Ray bonds the two with tough Sikaflex adhesive/sealant, then uses stainless-steel bolts every 24 inches, and finally fiberglasses the inside for a rigid and leakproof joint. In the design area, Sea Ray hasn't overlooked even the smallest detail. For example, all the above waterline drains, such as for sinks, air conditioning and bilge pumps, are channeled to a single common drain point in the exhaust. This not only eliminates the unsightly blemishes of drain fittings on the side of the hull, but it also prevents the usual hull stains. There are storage areas provided for the cockpit table as well as the covers for the sink and stove, which can get in the way when not in use. Underway, the 540 is no slouch and, with the twin Cat 3196 diesels putting out 640 horsepower each, our test yacht topped out at nearly 37 mph. A comfortable cruising speed of 30 mph will get you to Bimini, Block Island or Catalina is no time. Our test boat also had the optional bow thruster, which makes docking a breeze even in tight areas or with cross-winds. Beyond the pedigree, the sophisticated design, or the quality construction, you'll find a surprisingly well-equipped yacht. The standard Raytheon electronics package includes satellite navigation, Loran, VHF radio, depthfinder and speed log. The telephone intercom system (cockpit, salon and both cabins) doubles as a cellular phone, allowing calls to be placed from anywhere on board. A Lofrans anchor windlass is standard, as is the central vacuum system, full galley appliances, Bose stereo, and 12.5 kW Westerbeke diesel generator in a sound-insulating box. 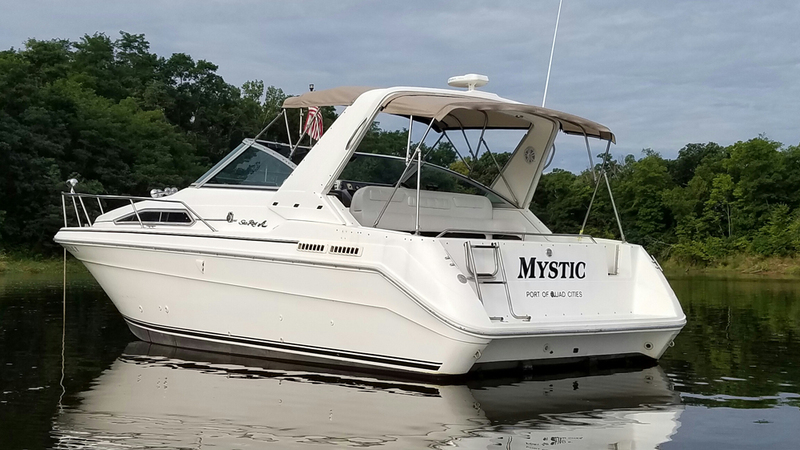 Our test boat had the optional fiberglass hardtop (great for sunny climates), but the standard boat includes a radar arch, Bimini top and full cockpit enclosure for all-weather cruising. 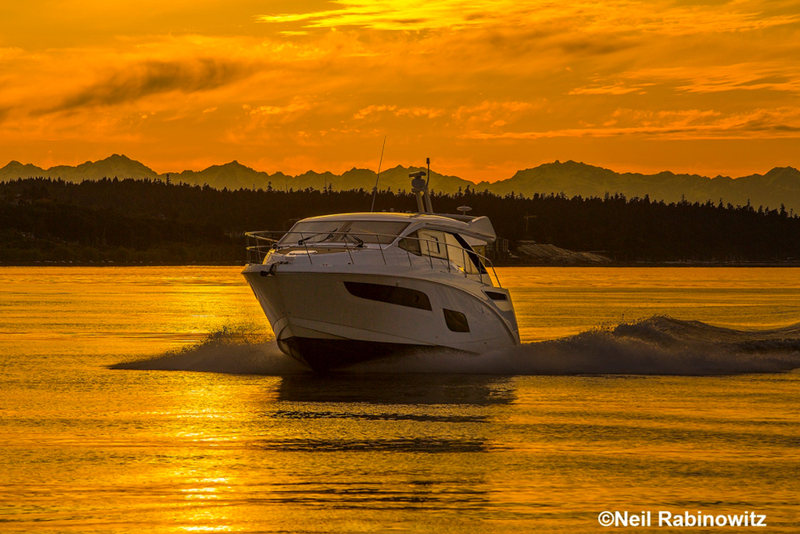 If you're considering a 540 Sundancer, you need to move fast. Five have already been sold just from the drawings alone and, now that we're leaking the news out, there's likely to be a surge of sales. 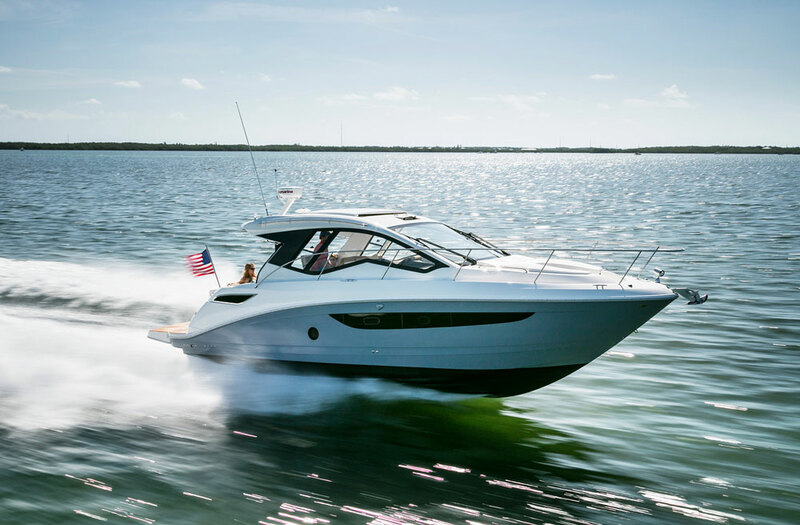 If you want a closer look, Sea Ray does offer buyers of its yacht line (50 feet and larger) the opportunity to compare all the yachts at their annual Yacht Rendezvous. Held each summer at their Merritt Island, Florida, plant, it also features displays by engine companies (Detroit Diesel, Caterpillar and Stewart & Stevenson) as well as other suppliers of optional equipment. Sea Ray provides lodging for the potential buyers, and you can find out the details at your Sea Ray yacht dealer. Driving away from the launch site, I could once again see the rocket towers of Cape Canaveral lit by the setting sun and I knew that Sea Ray wanted to keep their 540 Sundancer a top secret. I'd had a quick look at a highly classified product, but I knew that I had to tell the world. It was my journalistic duty. Just one word of warning: this article will self-destruct 15 seconds after you finish this sentence.